Bistrot Belhara in the 7th arrondissement features Basque-inspired cuisine from chef Thierry Dufroux, an alum of high-profile restaurants including Le Louis XV in Monaco. Bistrot Belhara, 23, rue Duvivier, 75007 Paris, 01 45 51 41 77. Chef-owner Jody Williams opened the original Buvette Gastrothèque in New York and has since brought the concept to the Pigalle neighborhood of Paris. The short and simple menu of French fare might offer options like a croque monsieur or coq au vin. Buvette Gastrothèque, 28, rue Henri Monnier, 75009 Paris, 01 44 63 41 71. 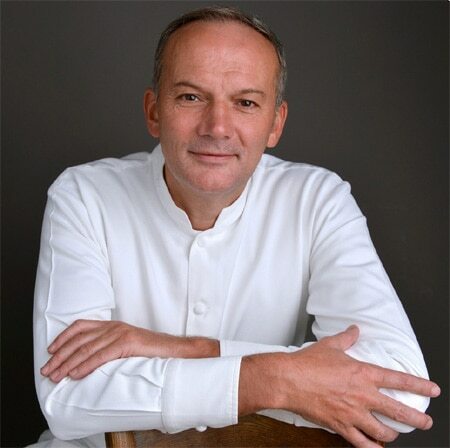 Chef Christophe Moret has left Restaurant Lasserre to become the new executive chef of the Shangri-La Hotel, Paris. He oversees the kitchens of three establishments: L’Abeille, Shang Palace and La Bauhinia. Philippe Labbé, held that job until last September. Restaurant Lasserre, 17, av. Franklin D. Roosevelt, Paris 75008, 01 43 59 02 13. Former executive chef Eric Briffard has left Le Cinq at Four Seasons Hôtel George V. Christian Le Squer, previously at Ledoyen, took his place in October 2014. Le Cinq, Four Seasons Hôtel George V, 31, av. George V, Paris 75008, 01 49 52 71 54. Closed for renovation since August 2012, the Ritz Paris hotel is scheduled to reopen in late 2015. Chef Michel Roth, who helmed L'Espadon, the gastronomic restaurant of the property, has divulged that he won’t be back working at the hotel. L'Espadon, Ritz Paris, 15, place Vendôme, Paris 75001, 01 43 16 30 80.